London Stratford. Home of the 2012 London Olympics, London’s newest and hippest postcode, and a huge shopping mall that you could easily spend all day in. Now though, now it’s also home to Roomzzz Aparthotel’s newest location – Roomzzz London Stratford. If you’re thinking of visiting London Stratford, or staying in the area as a base when you’re staying in London, here are the top 5 must-see attractions in London Stratford. London’s 2012 Olympic and Paralympic games were some of the most memorable ever and it has certainly left a lasting impression on the area of Stratford. The Queen Elizabeth Olympic Park has regenerated a whole area of London and with it has created an Aquatic Centre that’s open to the public, 111 acres of parklands which include gardens, meadows and wetlands, and the ArcelorMittal Orbit, one of London’s coolest viewing platforms. If you do visit the Queen Elizabeth Olympic Park, you might encounter one of the many events that happen throughout the year. 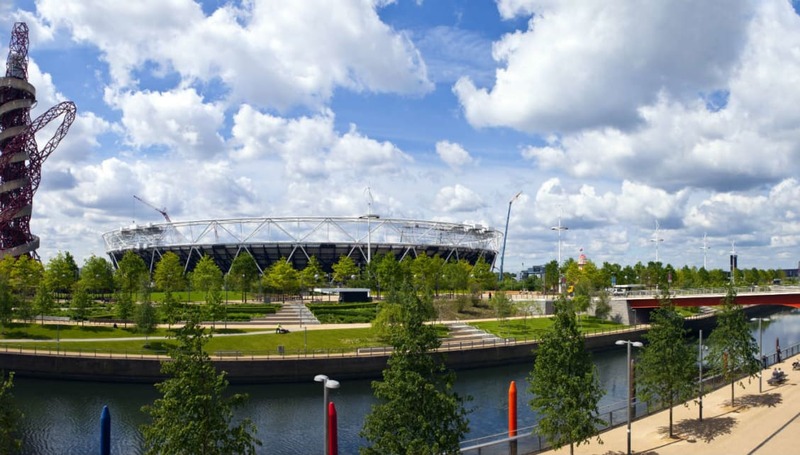 As well as being the new home to West Ham United Football Club, the stadium hosts concerts from the like of The Rolling Stones, Foo Fighters, and Beyonce and Jay-Z, and sporting events that bring back that Olympic atmosphere to London Stratford. For those that want to explore the nature surrounding Queen Elizabeth Olympic Park, there are 4 walking trails to choose from – London 2012, Art In The Park, Biodiversity, and Adventures In The Park. These are great walks for young families or anyone interested in wildlife and trail guides can be picked up from the information point which is opposite the London Aquatics Centre between 10 am and 3 pm. We know we’ve already mentioned the ArcelorMittal Orbit but believe us when we say this place needs a section all of its own. This thing is cool. At 114.5 metres high, the ArcelorMittal Orbit is one of the most fun places in London to see the skyline of the capital. 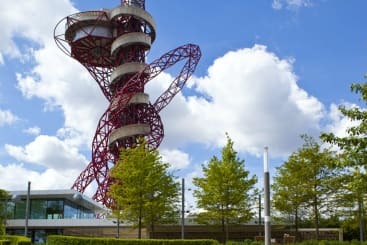 Designed by Anish Kapoor and Cecil Balmond, the ArcelorMittal Orbit features an observation gallery – which can be reached by lift or a challenging 455 steps – which is 80metres above the ground! For those that want an adrenaline-fuelled journey back down to the ground – or if you just don’t fancy going back down the stairs – take a journey on the slide that winds its way around the structure. At 178 meters long, this is the world’s longest and tallest tunnel slide and it takes 40 seconds to fly from the top to the bottom. It’s a fun experience and one that you won’t get anywhere else in the world! Are you ready to shop until you drop? To try on the newest fashion and eat at the most instagrammable restaurants? Well, you can do just that at Westfield Stratford, the largest shopping centre in Europe. With 250 shops and 70 places to dine, Westfield Stratford hosts a variety of high street brands mixed with labels you won’t find in many other towns. Get your department store fix in John Lewis, top up your makeup bag in MAC, let the kids run loose in the Disney Store, or try on clothes from places like Pull & Bear, Stradivarius and Arket. When you’re feeling peckish – which you probably will do after a few hours of shopping – sit down in one of Westfield Stratford’s food outlets. Go New York and try out Shake Shack, grab a sweet treat at Doughnut Time, or choose a delicious pizza from Franco Manca. 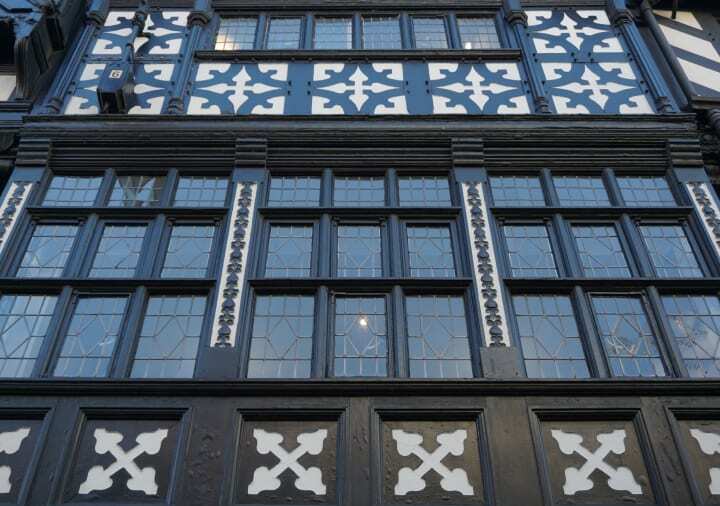 Of course, there are plenty of other options so have a good look around before you decide! 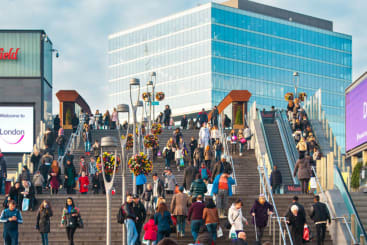 If you’re shopping with the family, or just want to have fun for a couple of hours, Westfield Stratford doesn’t just have the shops and restaurants. There’s also All Star Lanes Bowling and a Vue Cinema too. Westfield Stratford is basically a one-stop place for all your entertainment wishes! 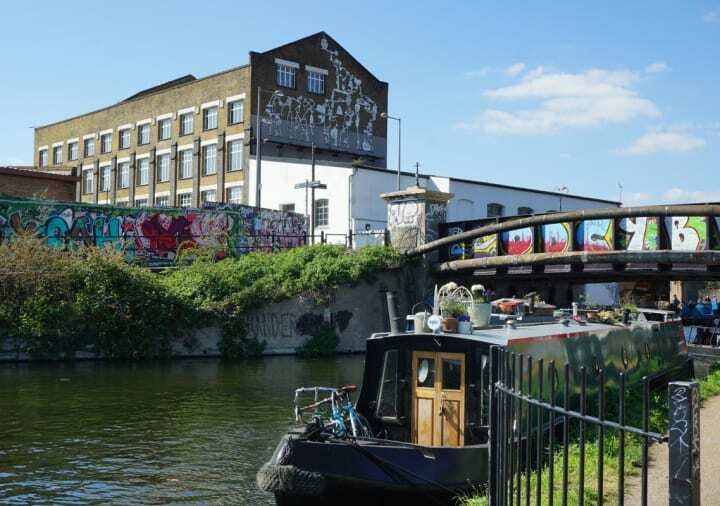 Known as “London’s Hippest Postcode”, The East Village in London Stratford used to be the Athlete’s Village in the 2012 Olympic and Paralympic Games. Back then it housed 17,000 athletes but now it is home to nearly 6000 residents and 23 retailers that make this one cool place to live. Now, even though it is quite residential, it’s a great place to walk around – you won’t feel like you’re in London at all. With lots of cool independent food outlets – including La Gelateria, some of the most mouth-watering gelato you’ll find in London! 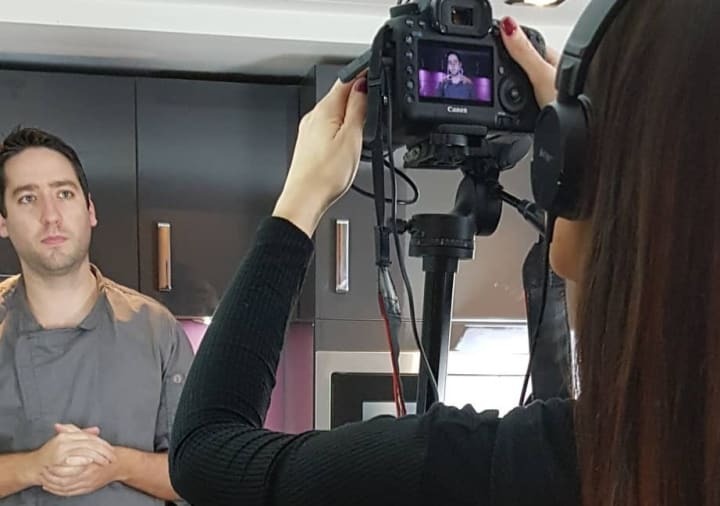 If you’re cooking in your kitchen in Roomzzz London Stratford, you can pick up fresh veg from Ted’s Veg and you can pick up freshly baked bread from Signorelli. Roof East London is one of the coolest hangout spots in the neighbourhood. It opens every summer, and this year is no different. With the rooftop bar serving a variety of drinks including match lattes, low-cal kombucha, and delicious house punches, you’ll easily be able to quench your thirst here. There’s also a crazy golf course, a batting cage from Sluggers, and rooftop yoga available throughout the week. If you want a date night with a difference, there’s also a rooftop cinema here throughout the year. Just check the dates for when this is one! Are you heading to London Stratford this year? Hopefully, this has given you some inspiration for what to do! If you do stay at Roomzzz London Stratford, don’t forget to use #Roomzzz for your chance to win a free night at Roomzzz location of your choice!